There are two extremely important switches accessible on the 1400 LT. The first is the Internal/External Drive switch, located next to the power button. This switch should always be set to Internal, which will boot disks from the left-most 3.5" floppy drive. The 1400 LT does not use the same external disk drives as the Tandy 1000 EX and HX. It can use a 5.25" DD drive from Weltec, which should have its own power supply because there are no power lines provided by the External Drive Port. I would suggest that you could use any drive by fashioning a custom cable and providing external power to the drive. Tandy also supported using a 1.2MB 5.25" HD drive, but that had to connect via the parallel port and cannot boot on its own. The external drive support feature will not only allow you to use 5.25" double density disks with the 1400 LT, but you can boot from them as well. The Convertible has no ability to work with 5.25" disks, which was a serious flaw in 1986 where there was no software available on 3.5" disks. The release of the IBM PS/2 computers a year after the Convertible really provided software publishers a reason to publish their software on 3.5" disks as well as 5.25" disks. The second important switch is the Monitor On/Off switch, located underneath the AC Adapter (15v, 700mA, center negative) socket. When this switch is Off, the system will boot to display to the LCD screen. When the switch is On, the system will boot to display to an external CRT. 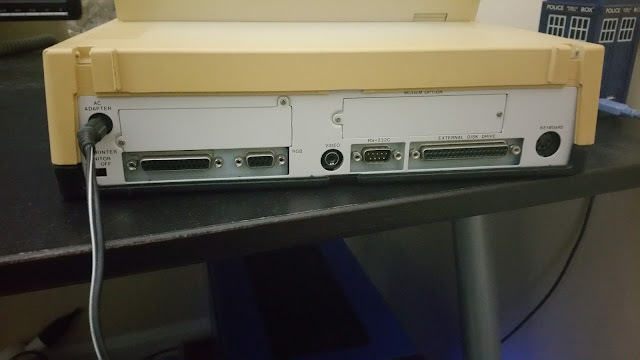 The CRT can be a composite monitor or a CGA-compatible TTL RGB monitor. The 1400 LT will not display to both the LCD and a CRT at the same time. If you boot to the LCD, you will see random static lines on a CRT. If you boot to the CRT, the LCD will seem dead. The green Power LED does not stay on if you are using the AC adapter to power the system. Unlike the Convertible, which could come with one of three LCD screens, the 1400 LT always came with a backlit, supertwist LCD. There is a contrast knob on the left side that can adjust the contrast. At one extreme, the LCD will appear totally blue, at the other totally gray, so you want it somewhere in between. The LCD backlight does make some electrical noise, and can be turned off with the help of utility software. It is very difficult to see what is on the screen when the backlight is off. It may be worse than the original LCD for the Convertible, which was just a Twisted Nematic panel. When the backlight or the LCD is off, the system is silent other than what may be playing through the PC Speaker. The original LCD for the Convertible was very difficult to read, so the SuperTwist LCD markedly improved contrast. Only the latest Convertibles would be provided with a backlit SuperTwist LCD. 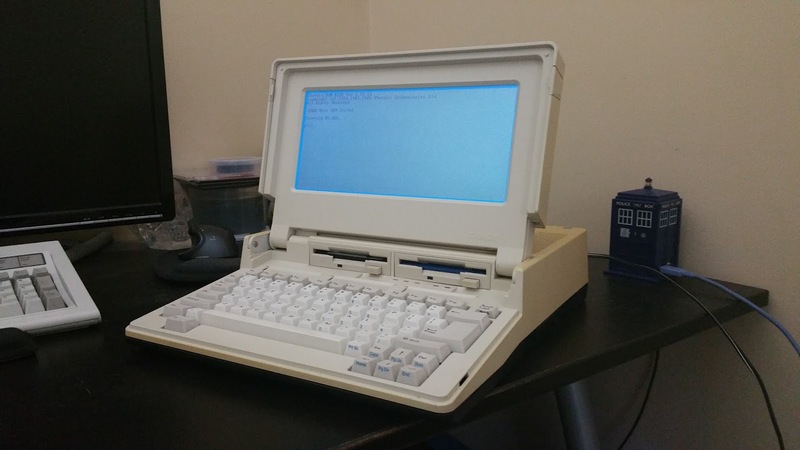 The Convertible does allow you to easily remove the LCD, unlike the Tandy 1400 LT. The LCD's native resolution is 640x200, which is the same as the CGA 80-column text mode. Unlike real CGA, there is no snow on the 1400 LT. The video hardware does not emulate MDA, unlike the Convertible. The 1400 LT's PC Speaker's volume can be adjusted, but you have to remove the Ni-Cd battery pack to get at the adjustment screw. Then you will need a tiny screwdriver to adjust the volume. I do not believe the Convertible had a speaker adjustment unless you connected an IBM 4863 or 5145 monitor, which had a speaker built-in and could be sent speaker data from the CRT adapter. Only PC Speaker sound is supported, and I find the PC Speaker sound to be rather filtered, similar to how it is output through a Sound Blaster or Pro Audio Spectrum 16. The system speed is notably faster on the 1400 LT. The 1400 LT uses the V20, running by default at 7.16MHz. This is switchable to 4.77MHz for compatibility. The Convertible uses the slower 80C88 at the stock IBM PC/XT speed, 4.77MHz. The 1400 LT can be upgraded with a numeric coprocessor. The V20 is socketed, so you could conceivably install an 8088 or 80C88 to solve a compatibility issue, but I have not tried this. The BIOS may use opcodes that function only on a V20 or above. You can use the MODE command with the SLOW or FAST parameters that come with the MS-DOS supplied with the 1400 LT to change the CPU speed. A 1400 LT should always have 768KB of RAM in the system. A Convertible can have as little as 256KB, and 512KB was the maximum amount of RAM supported by IBM. Third-party cards can increase the Convertible's RAM to 640KB. It should be noted that both systems have 16KB of separate video RAM. The Tandy's extra 128KB can be configured to act as a RAM disk or a print spooler. Expansion is generously provided on the 1400 LT. You have a unidirectional parallel port, a serial port and an external keyboard input port. The parallel port is protected so that removing the cord while the devices are powered on won't damage the port or the printer. The serial port shares the resources with the internal modem, so you cannot use a serial mouse and the modem at the same time. It is best not to install the modem at all if you intend to use the mouse, but if you do, you should designate the serial interface to RS-232 instead of Modem in the setup program. The external keyboard connector can accommodate an XT-protocol keyboard. My IBM PC/XT 83-key keyboard worked fine with the 1400 LT once I had set the system to use an external keyboard in the setup menu. My IBM Model M keyboards did not work at all, but their XT compatible operation is a bit finicky. The Tandy Enhanced Keyboard is sure to work. Considering the 1400 LT I received has dead Up Arrow and \| keys, this is very helpful. The keys are easy to remove with a chip puller, unlike the Commodore 64's keys. You may have noticed that I have been continually referring to this setup program. You can access the setup program in DOS by pressing Ctrl + Alt + Ins. The Setup Program gives you eight options, selectable via F1-F8. F1 sets the standby time, which is the time the system takes to go into standby mode if you are not pressing keys on the keyboard. The default is 10 minutes but can be set up to 3 hours and 59 minutes. F2 tells the system whether to display to the LCD or CRT. You can also use Ctrl + F11 to display to LCD and Ctrl + F12 to display to CRT in DOS. Since I do not have an XT compatible keyboard with an F11 and F12 key, I am not sure whether you can use this function except with the internal keyboard. F3 selects the internal or external keyboard, F4 selects whether the serial port or the modem will be assigned to COM1, F5 indicates whether the modem is a Direct Modem or an Acoustic Coupler, F6 indicates whether the internal or external graphics card will be used, and F7 dictates the CPU speed. 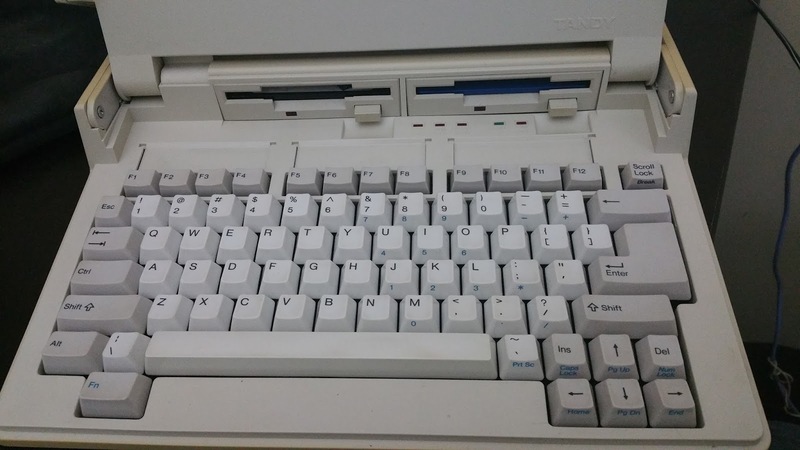 The keyboard is very decent, especially for Tandy. The key feel is more responsive than a Tandy 1000's keyboard and not nearly as stiff as the Tandy Enhanced Keyboard. Some keys may register a double press when a single press was intended, but this may be due to the wear on some of the keys. The 1400 LT's key layout is superior to IBM's in some respects. The 1400 LT has full-sized cursor keys, which is a big advantage when playing games. The Convertible has separate Num Lock and Caps Lock keys, but a smaller right shift key. The Convertible's layout is slightly friendlier to modern 101/104 keyboard users, but the differences are minor. The 1400 LT has a longer Spacebar and Backspace and larger Fn, Ins and Del keys. The Convertible lacks F11 and F12 keys, but they are not used much in most programs that run on XT-class machines. The Convertible does have a discrete Prt Sc * key, so typing in *. * is very easy. The keyboard uses mechanical keys and has each key soldered into a PCB. Each key has a diode, so n-key rollover is achievable. The keyswitches are Mitsumi miniature mechanical white keyswitches, and more information about them can be found here : https://deskthority.net/wiki/Mitsumi_miniature_mechanical The white switch shown as the first picture on that page is what the keyswitches for this keyboard looks like. The switches are tactile but not (intended to be) clicky. They do not have a strong tactile feel, but some are somewhat more tactile or click than others, perhaps due to age and use. Replacing them may be difficult, only one other product is known to use the same keyswitches and the shape of the keycaps requires a depression in the keystem. Most keystems have shafts or larger holes. As a temporary fix, I desoldered the Up Arrow keyswitch and replaced it with the ~` keyswitch. You can use Alt + keycodes to insert a character at a DOS prompt which is covered by a broken key. In my case, \ is 92, ` is 96, | is 124, ~ is 126. Fortunately these keys are not used too much in DOS. The numbers have to be entered from the numberpad in DOS. Note that with the 1400 LT you have to turn the Num Lock on and use the number arrangement over the letters to get the Alt sequences to work. 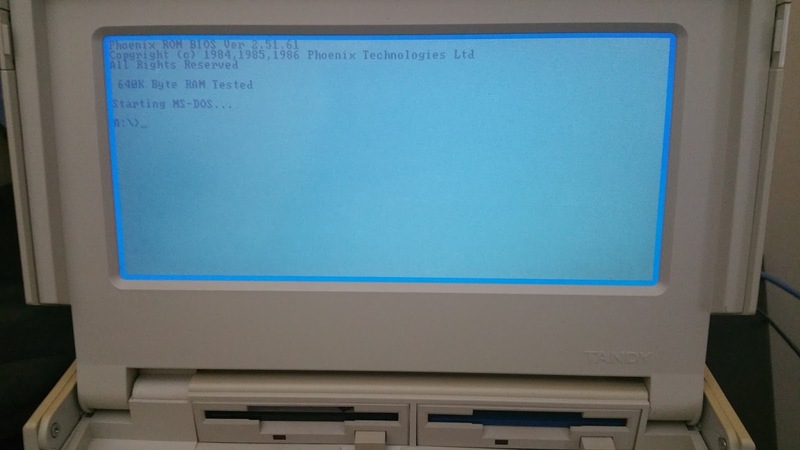 There is an RTC on the 1400 LT, and it can be set with the DOS DATE and TIME commands that came on the version of MS-DOS 3.2 supplied with the system. There are also 3rd party programs on Tvdog's FTP that can set the Date and Time. Unfortunately, the 1400 LT uses one of those dreaded rechargeable barrel battery packs. These things are the bane of vintage computer enthusiasts because they corrode and can leak acid, destroying motherboard traces. The batteries are 3.6v Ni-Cd and should be replaced. While the system can run without the main Ni-Cd battery installed, I do not know if you can get away with clipping off the RTC battery. The main rechargeable battery is 10 C-size Ni-Cd batteries arranged in a 5x2 pattern and wired in series. Each cell can provide 1.2v and 2200mAh, so by wiring them in series, you will get 12v at 2200mAh. The battery pack could be easily replaced with modern Ni-Cd batteries. The battery pack in my 1400 LT had corroded leads, so the system cannot charge the batteries anyway. Compared to the Convertible's static. low power SRAM and 80C88, the V20 and the DRAM in the 1400 LT do not spare the battery at all. The floppy drives are 3.5" drives and can format 720KB disks. However, if you do not have the MS-DOS 3.2 that came with the system, you will need to add a command to your config.sys to get the format working correctly. The command is drivparm=/d:0 /f2 and drivparm=/d:1 /f2 These drives support drive select, so the system will sometimes not respond until you physically insert a disk into the drive. The LCD does not distinguish between intense and non-intense colors, so only eight colors are really distinguishable. Of those eight colors, five are pure and three are flickery. Of the three CGA palettes, palette 0 (green/red/brown) is highly affected by the flicker, palette 1 (cyan/magenta/white) is not affected (unless the background is set to a flickering color) and the alternate palette (cyan/red/white) is somewhat affected (moreso if the background is set to a flickering color). If the game has a 640x200 composite color mode, you may want to use that on the LCD for sharp, flicker-free graphics. 640x200 games almost always use gray or bright white on black. Pitstop 2 uses light green on black, but that game is the only one I know of that uses a color on black. The default LCD color scheme is reversed from a CRT. In other words, color 0 is gray or light on the LCD while color 7 is blue or dark on the LCD. This sets the color palette to use the same color for black & blue, green & cyan, red & magenta and brown and white, as well as their intense versions. Since the four color modes seldom use those combinations of colors on screen at the same time, the command should be good for most games. You can use the program to play around to suit your taste, but remember that the first number is the value where the palette you wish to edit begins, then each pair of numbers corresponds to one palette entry. Note that many CGA games try to simulate more colors through dithering, and this will cause flicker in 320 modes. Opening the system should be done by carefully reading the 1400 LT Service Manual, which is available on Tvdog's FTP. The hardest part is unscrewing the screws holding the laptop hinges to the case. I stripped the screws and had a hard time getting them out. I had to use a dremel to cut a slot into one, which marred the hinge a bit. Fortunately the hinges in the 1400 LT are made of metal. You can use flat internal hard drive screws as a replacement, just don't tighten them too much. You will need small screwdrivers to get into the 1400 LT. If your 1400 LT is yellowed, you may break off a plastic bit or two opening the system up. I managed to mangle the Internal/External drive switch irreparably in putting the system putting it back together. 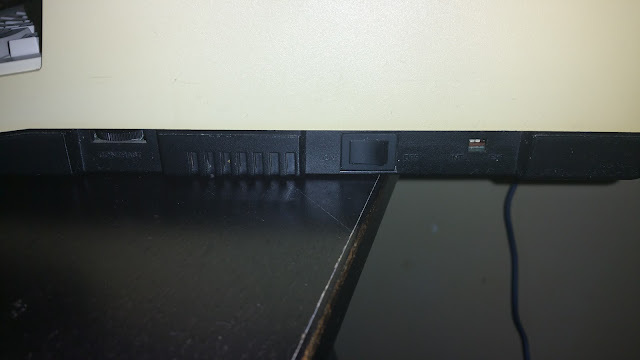 I removed the body of the switch and put a blob of solder connecting the middle terminal to the left terminal, thereby permanently setting the system to boot from the Internal drive until I replace the switch. I doubt I will be needing to boot from a 5.25" floppy on this system any time soon. If you boot and the system is set to a non-existent External drive, you won't get to do anything until you set it back. The most important feature the 1400 LT may have over the Convertible is its Expansion Slot. This slot has almost all the signals you would find on the 8-bit ISA bus. There are no voltages except +5v, IRQs 4, 6 & 7 and DMA 2 are not present. The cards use an edge connector, nothing proprietary here. You can source +12v and -12v and more +5v from the nearby Modem slot. The Convertible can theoretically host numerous adapters through the add-on upgrades (called "slices"), like an IBM PCjr. However, the connector is proprietary, the address and data lines are multiplexed and an expansion requires an enclosure, so nothing was ever made for it that did not come from IBM. The Tandy 1400 LT Hard Drive upgrade will take up the Expansion Slot and one of the 3.5" drive bays. The Hard Drive controller is MFM based and requires a 3.5" MFM drive, which are not easy to come by. If you want a more modern solution, Lo-tech's XT-CF card will give you the benefits of mass storage and an XT-IDE controller and BIOS. Unfortunately, you have to build the card yourself and it does have surface mounted parts. 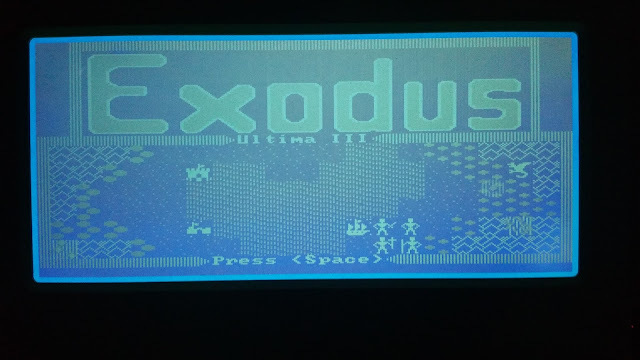 One of the system's weaknesses is the lack of a game port, but it is quite feasible to make one with an Expansion Card. The system's successors, the Tandy 1400 FD and HD, have the hard drive interface built-in, so the expansion slot is not sacrificed. They also have separate COM assignments for the serial port and the modem. Their setup program lets you set the date and time without needing the special MS-DOS that came with the system or a third party program. The newer models run at a default 8MHz speed. They do not support composite video output. They also have a 12v, 4400mAh battery, but the battery may be custom made compared to the taped cells of the 1400 LT. They come with MS-DOS 3.3 and may have better CGA compatibility (as in 160x100 graphics will work) than the 1400 LT. Their keyboards use a rubber dome keyboard, it is unlikely that they will feel as good as the 1400 LT's. Love these old portables. Wish i had one. Have you seen one called Grid? I've seen some photos, very nice design! "Portable" meant almost 14 pounds. The HD on MY model was as expensive as the computer, which I got for $1600. It was the best deal on the market as it had a built in monitor & TWO 3.5 floppy drives. That was head blowing for me back then as every other machine I looked at was $166 without the monitor and only one drive. Of course, Tandy (Radio Shack) relied on the inexperience of the computer buyer. I got the computer, a Word processor program called "Term Paper Writer" for a good price. Three floppy disks cost me about $40 in 1989. That was outrageous even then, but I did not know that until I started to shop around. Hi, love this review. Learned a lot about this computer. I noticed you mentioned that you can turn the backlight on and off? How is this done, exactly? blnk14.zip has the backlight turn on/off utility. tandylcd.zip allows you to reverse the LCD screen colors. Ah yes. This was a big help. Thanks! Hi! I am looking for boot disks for exactly this machine. Do you still have them or at least some copy of it? I have a 1400 and trying to fix power supply. Axfew caps labels are gone. The one tech doc I found looks to be different power supply. Ideas? Thank you for this post! 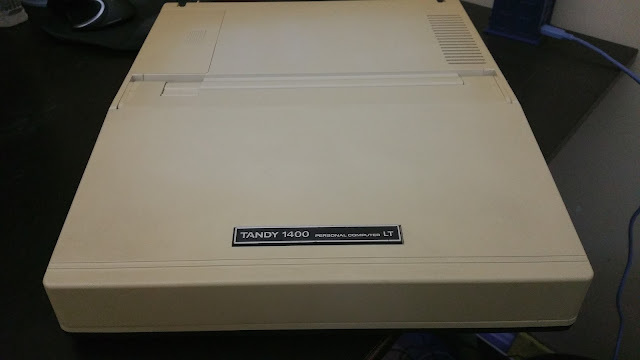 I just got my brother's old Tandy 1400LT up and running. I was confused why I was only seeing 360K after formatting the disks. After reading past your mention of drivparm few dozen times it finally sunk in. Of course, I tried copying and pasting your settings into config.sys without thinking, and then got it right by putting both commands on separate lines. What's next? I should open it up and change out the clock battery before bad things happen. Thanks again for saving the day! I'd check the rechargeable battery first, its Ni-Cd and likely in rough shape. I need to throw mine out. Cadmium is not healthy for human beings. Hi, I just got one of these from eBay today. Since I can't find any 15V/700mA power adapter for this model, what type of power adapter can I use? Also, what's the plug size? However, you have to switch the Centerpost to Negative. Easily done by modifying the end that you plug in the barrel plug so you can switch it around to backwards. Making the centerpost as Negative instead of positive.